This #parentadvice blog post was inspired by this Daily Prompt: Interplanet asking you to design your own planet. Mine: Doggie World. We’d all go to heaven if parents learned to parent from loving dogs. Mother and father dogs know punishment is a necessary teaching tool, Mother dogs start the process. Watch a mother dog with her pups and see how she does it. The kindest parents treat their children like dogs, puppies that is. Here are five tips for parenting as the dogs do it. Tip two: Proper punishment involves being clear about rules; making the child clear about the rules; warning first – dogs growl, parents can do the same; making the punishment fit the crime; increasing the punishment until submission is obtained; re-establishing a loving relationship once submission is obtained. Tip three: Notice that punishments begin as soon as the puppy is big enough to break rules. For a child that starts with toddlerhood. Keeping children safe and keeping others safe from being hurt teaches life’s major rules. Tip five: When the child has submitted to your request for proper behavior, make soft face and strong body to show your caring. You can get a free digital copy of the Strong Body and Soft Face Poster Coach at the EFTI Store. Download it and post it where you will see it throughout the day. Every time you see the poster take a minute to practice Strong Body and Soft Face. 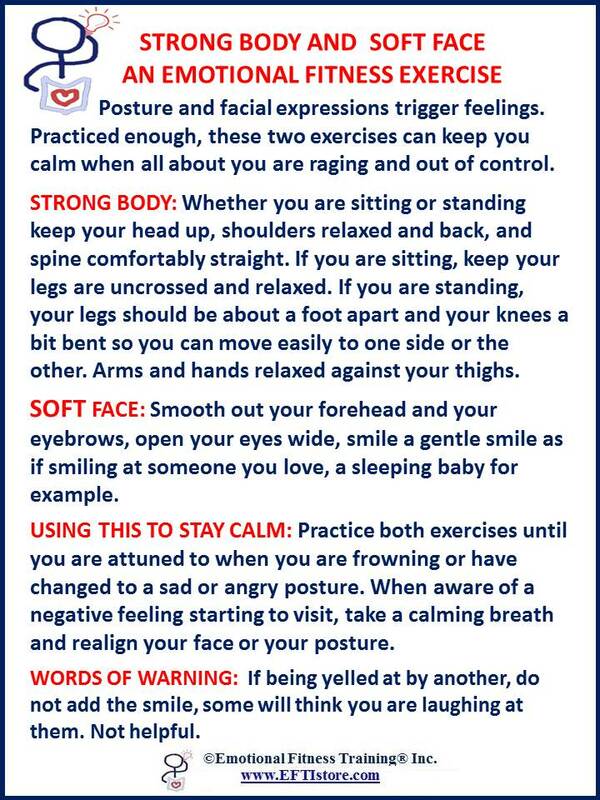 take a calming breath, recall or plan an act of kindness; feel the calm strength this exercise creates in your being. As always also practice patience for parenting is hard work and the results not always apparent immediately. Be grateful for what you have been given, forgive yourself and others for failing to be all that is good as you continue to practice kindness and bring forward a more just world for all. Most EFTI posters posted on my blog can be obtained at the EFTI Store Many are free. This entry was posted in When Good Kids Do Bad Things and tagged Emotional fitness, Emotional Fitness Training, Emotional Health, emotional intelligence, How dogs do it, Katherine Gordy Levine, parenting, Parenting advice, parenting tips, parents, postaday, Strong body and Soft Face. Bookmark the permalink.